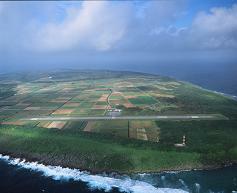 The construction of Hateruma Airport, initially an emergency landing airport (specifically for medical emergencies), was funded by USCAR (the United States Civil Administration Ryukyu Island) in March 1972. Private airlines began operating from the airport in September the same year. The airport was then relocated and developed in 1974 to comply with the Aviation Law. It resumed service again in May 1976 with an 800m-long runway.Hateruma Airport was originally constructed as an emergency landing airfield (mainly for transportation of patients requiring first aid) with the financial aid of the U.S. Civil Government in March 1972, in September of the same year, the operation of civil aviation started. Since 1974, in accordance with the Civil Aeronautics Law, the airfield was removed to a new site and improvements were made to start the services of the new airport with an 800-meter long runway in May 1976.